DAET, Camarines Norte—Several members of the Liberal Party here have filed a mass motion approving an indefinite leave of absence from the party, following Governor Egay Tallado's recent expulsion from the party's National Directorate. 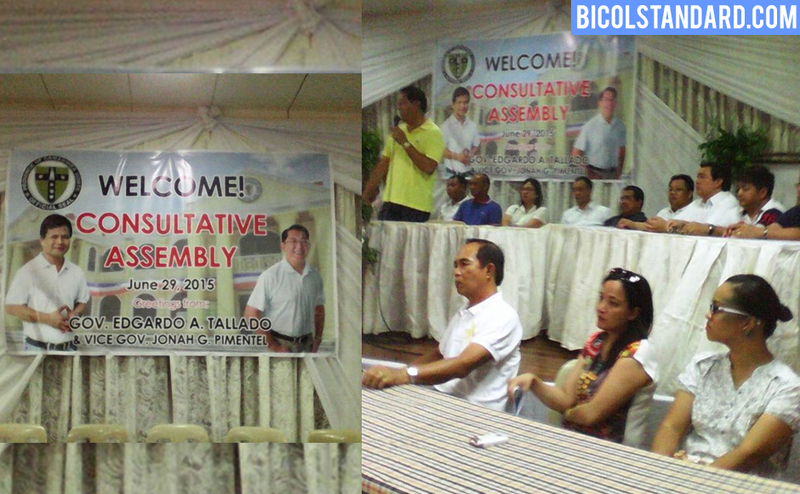 Vice Governor Jonah Pimentel presided over the consultative meeting, in which at least seven Board Members, seven incumbent mayors, vice mayors, councilors and barangay captains who are members of the Liberal Party in Camarines Norte were present this afternoon (June 29). They include Vice Governor Pimentel, Board Members Marmol, Gache, Herrera, Baning, Pimentel, Quinones,and Pardo, Mayor Ascutia and Vice Mayor Francisco of Labo, Mayor Lo and Vice Mayor Salalima of Mercedes, Mayor Magana of Talisay, Mayor Ong and Vice Mayor Villamor of San Vicente, Mayor Borja and Vice Mayor Ibasco of Sta. Elena, Mayor Davocol and Vice Mayor Barrameda of Basud, Vice Mayor Arguelles of Capalonga, and Vice Mayor Herrera of Vinzons, as five municipal councilors of Daet, and a majority of punong barangays and barangay councilors. Tallado himself was absent during the meeting. On June 24, the Liberal Party sent a resolution to the provincial chief executive kicking him out for "grossly immoral conduct." The resolution read: "The LP can only be as reputable as its members. To enable the LP to be an effective instrument in achieving the Tuwid na Daan, it is necessary that its members should strive at all times to uphold the honor and maintain the dignity of the party, even in their private lives." Tallado earlier said he respected the decision of the Liberal Party.—With report by Mahatma Gan/BICOLSTANDARD.COM Pirming enot. Pirming bago.